Get ready because HEXBUG is making waves with a revolutionary, new Aquabot – the HEXBUG® Aquabot Jellyfish! Loaded with smart fish® technology, this new Jellyfish will amp up the action of your robotic aquarium with its vibrant inner glow and 15 pre-programmed swimming routines. Watch as the Jellyfish uses its 18 tentacles and powerful ducted impeller motor to spin and swim gracefully as it explores its new home. Want your Jellyfish to dive deeper? No problem! For the first time ever, users can adjust the HEXBUG Aquabot’s buoyancy (using adjustable weights in battery door) to give their pet customized swimming patterns. To turn on your Jellyfish, simply drop it in water to activate its automatic on and off sensor. Waking up your Jellyfish is easier than ever! Thanks to its hi-tech sensors and our patent-pending technology, users can wake up their underwater friend in three different ways: simply run your fingers through the water, touch the Jellyfish, or tap on the side of your tank. Done playing? After several minutes of swimming, the HEXBUG® Aquabot will go into sleep mode to save battery life. The HEXBUG® Aquabot’s unique design elements were carefully chosen by our engineers to get children to think about the science behind our robots. Now kids can truly experience the fun of having a pet fish collection without the messy cleanup! HEXBUG® Aquabot Jellyfish is compliant with CPSIA standards. Available in five translucent colours; three button cell batteries are included. 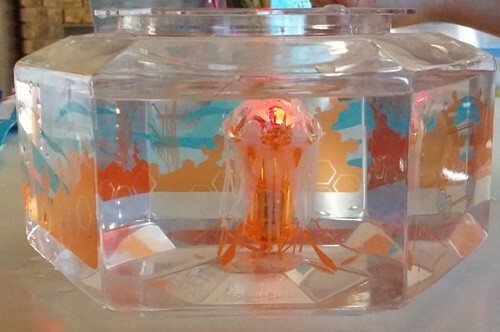 My Little One has an orange HexBug AquaBot Jellyfish that she loves. The Jellyfish really moves up and down, spins, and lets out tiny bubbles. It is a great addition to our HexBug AquaBot collection especially with how much we love Jellyfish. 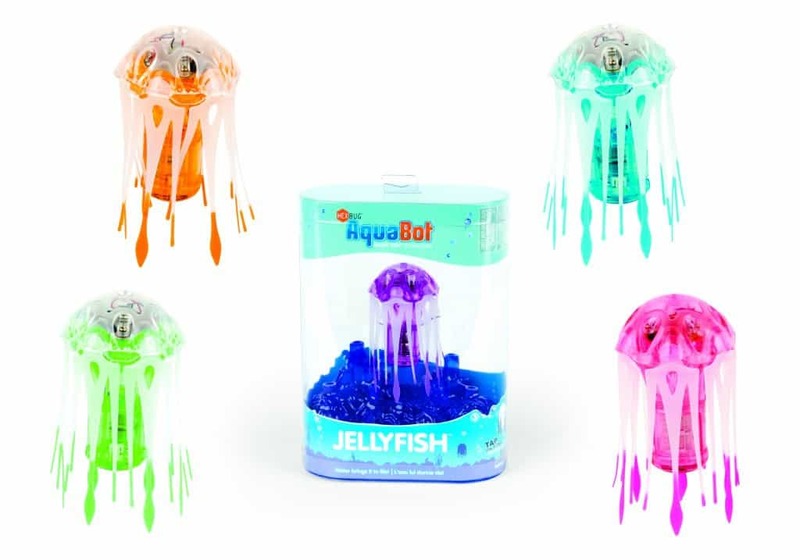 The HexBug AquaBot Jellyfish comes in 5 different colors: Pink, Purple, Orange, Blue, Green. We have the orange one as you can see in the picture above. My Little One really wants to get the pink one. I have seen some reviews that left people wondering how to change the batteries. Our HexBug AquaBot Jellyfish came with instructions on how to change the batteries along with the little tool to do so. There are also instructions on the HexBug website with a video to show how to change the batteries. I also read one review that said the batteries did not last long. I disagree with this review. We have played with our Jellyfish a number of times and our batteries lasted quite some time. We have not even had to change the batteries in our Jellyfish yet. Additionally, the Jellyfish goes into sleep mode after several minutes of swimming to help save the batteries. Collect the NEW HEXBUG AquaBot™ Jellyfish to expand your aquarium. With a powerful impeller motor to spin and swim gracefully the Jellyfish can dive even deeper by easily adjusting the HEXBUG AquaBot’s™ buoyancy (using adjustable weights in battery door). Waking up your Jellyfish is easier than ever! Thanks to its hi-tech sensors users can wake up their underwater friend in 3 different ways: simply run your fingers through the water, touch the Jellyfish, or tap on the side of the tank. After several minutes of swimming, the HEXBUG AquaBot™ will go into sleep mode to save battery life. The Jellyfish is pretty awesome, fun to watch, and a great addition to the HexBug AquaBot line. I really love the AquaBot line of products as I feel that they appeal to both girls and boys.